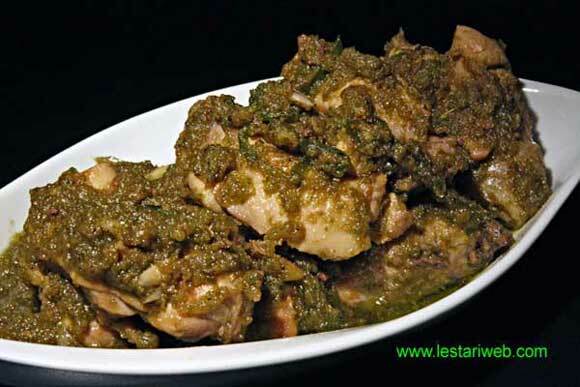 Here it is a chicken dish in Maluku style: Bumbu Hijau Ayam Banda. Hijau means green. The name already suggests the character of this dish, which is dominated by green color comes from green chillies. From the reference book that I mentioned above, there is no scharf birds chilli. Since I like it a bit spicy, I have added green bird chillies on the recipe. The result hmmmm .. savory-delicious a litle bit spicy taste dish ;-)!! For you who are chili fans, you can try & find out yourself. But for you who are chilli stranger,just skip it as original recipe. It still taste good ;-). Catatan : Like many of Maluku specialties, here we are supposed to use Kenari Nuts. But unfortunatelly this ingredient is impossible to get in the west even in other Asian countries. Research from internet suggested that Kenari nuts is only used in Maluku & Philiphine. Blanched almond is commonly used as subtitute. Slice each of the chicken breast diagonally into 5 or 6 thin slices. Put the sliced chicken into a bowl & rub them all over with lime juice & salt. Put aside. Slice the lemon grass & green chili very finely. Keep aside. Put all ingredients for the paste in a blender or food processor and blend until smooth. (If necessary add a little bit oil to help the blending process). Heat 2 tbsp oil in a frying pan (Don't add oil if already added in a blender). Stir fry the paste over medium heat until fragrant (takes about 5 minutes). Add the lemon grass & green chili. Stir fry for another 1 minute until wilted. Add the chicken slices, stir & cook over higher heat, stirring often for 10 minutes. Adjust the stove into medium heat, simmer until the chicken are well cooked & becomes tender. Add 3 - 4 tbsp hot water if necessary. Adjust the seasoning. Add salt (& sugar) to taste.